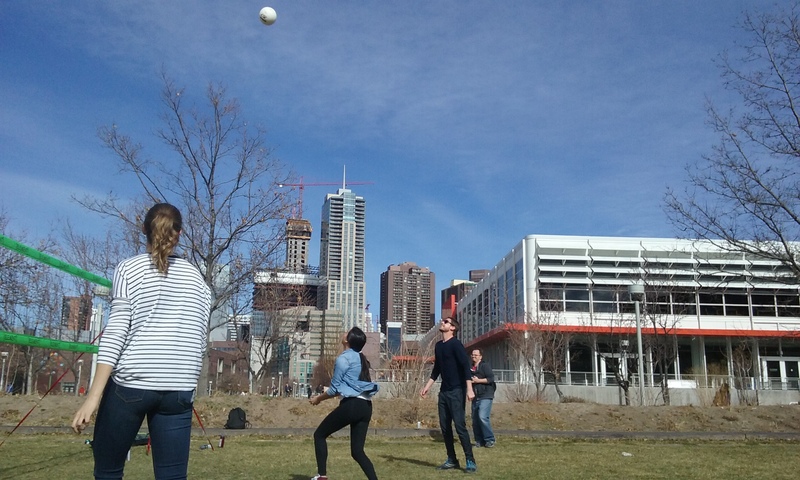 DENVER, Auraria Campus – Element social club organized a volleyball game in Lawrence Street Park, for students to socialize and have fun, Thursday afternoon. Despite the wind, Element recruited around 11 students from the three Auraria Campus schools, Community College of Denver, University of Colorado in Denver and Metro State University of Denver for a friendly game of volleyball. They set up a net and began to play with no rules, uniforms or coaching. Element has four employees, who organize and promote all events, including concerts, Frisbee Golf and board games. Element Student Director James Weiner explained that Element is an MSU Denver Social Club, but it is open to anyone on campus who wants to join. They don’t have to be a member to participate in their different activities, to socialize and feel included in a campus that people come and go. Volleyball is one of their outdoor activities along with soccer and flying disc. During cold weather, they organize indoor games. Hannah Ho is a Political Science and Communications student at MSU Denver, who joined the club last week. Leticia Anaya is a Denver-area freelance journalist.